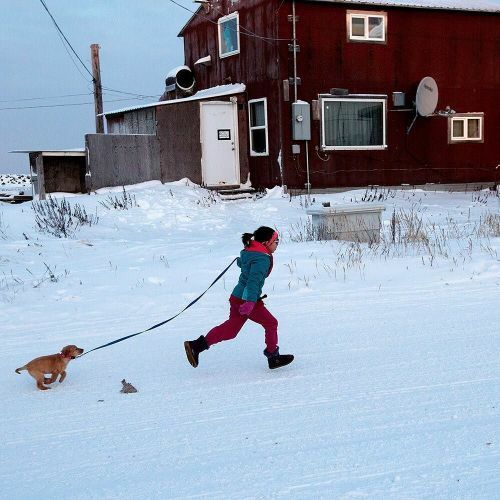 "Last December, the photographer @nimataradjiphoto traveled to Shishmaref, Alaska, to photograph how its 600 Inupiat residents are coping with climate change. The project is centered on people, like the young Shishmaref resident pictured here. "I had seen many photos of the falling house and the erosion and videos about the erosion," @nimataradjiphoto said. "I wanted to show what it is all about. Erosion without people being affected is irrelevant. I wanted to show the people who are actually impacted by climate change." This #nytweekender, we're sharing more photos by @nimataradjiphoto that demonstrate how Alaska's melting ice affects villagers living on a barrier island. Visit the link in our profile to see more of @nimataradjiphoto's work on the #LensBlog." By nytimes on Instagram.